As networks, devices and media converge, telecoms companies have increasingly complex catalogues of products and services on offer to customers who are, in turn, becoming more aware that they can easily switch to other providers. However, the sales process is complicated by a plethora of options, influences from new media, Web 2.0 and social networking, as well as completely different methods of communication and transacting. 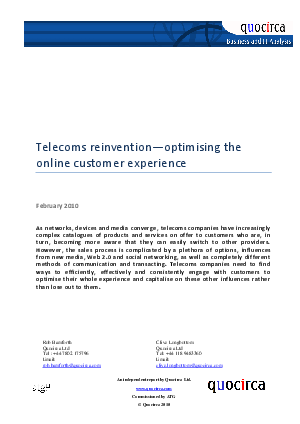 Telecoms companies need to find ways to efficiently, effectively and consistently engage with customers to optimise their whole experience and capitalise on these other influences rather than lose out to them.